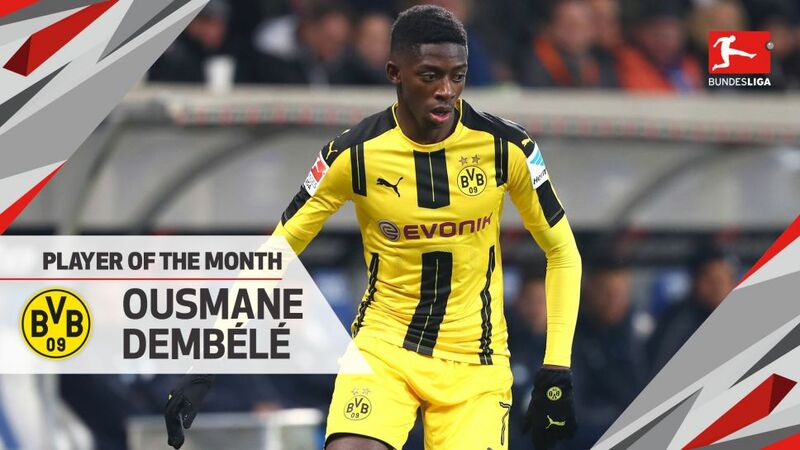 Bundesliga | Dembele voted as December Player of the Month! Borussia Dortmund's Ousmane Dembele beat off some stiff competition to win the December Player of the Month award. Dembele voted December Player of the Month! Borussia Dortmund attacker Ousmane Dembele has been voted as the Bundesliga's Player of the Month for December. Use your unlimited transfers during the winter break to add Dembele to your Official Fantasy Bundesliga team! @Bundesliga_EN followers across the globe cast their vote, and in the end Dembele was the clear winner. What a debut season it has been for Dembele in the Bundesliga. The BVB winger has gone from strength to strength since arriving in the summer, and December was a particularly impressive month for the 19-year-old, who is rated by UEFA as one of the breakthrough stars in the Champions League this season. Two goals and as many assists saw him help the Westphalians get through the month unbeaten, while his mature performance in the 2-2 draw at Real Madrid CF had Europe taking note of this emerging star. With five goals in four games, December witnessed the Lewandowski of old as he powered FC Bayern München's surge back to the top of the standings. With just two goals in his previous nine games – both coming in the derby win over FC Augsburg on Matchday 9 – the 2015/16 league top scorer had something to prove, and he did so in style by moving onto 133 Bundesliga goals – as many as the great Giovane Elber and second only to Claudio Pizarro on the list of all-time highest foreign goalscorers in Germany's top flight. One of the strings to Thiago Alcantara's bow is the extraordinary number of touches he has on average each game, and he put in one of his most impressive performances yet in the 3-0 win over RB Leipzig, which saw Bayern cement top spot heading into the winter break. He supplied a goal and an assist in that game, playing in a more advanced role and ensuing Carlo Ancelotti's tactical gable paid off. The coach now has plenty to think about when considering the Spaniard's best position moving forward. No other German player scored as many goals in the Bundesliga in the 2016 calendar year as Sandro Wagner, who netted his 19th of the year on Matchday 16. That took him to nine for the season, with four of those goals coming in the month of December alone. TSG 1899 Hoffenheim have never lost when the former Bayern forward has found the back of the net, (four wins, four draws) and Germany coach Joachim Löw has also admitted he is a fan of the much-travelled 29-year-old.